Let’s get a jump on what it takes to make a great Zimfest! The Zimfest Board has come up with a few exciting fundraising ideas to help raise some much needed funds for Zimfest 2016, with an emphasis on Zimbabwean teacher expenses. We ask you and your music community to pitch in and help support the heartbeat of our organization. Our Zimbabwean teachers bring the spirit of the music with them to share with us. Year-round this spirit holds our communities together throughout North America. Organizing committees are hard at work in the winter months preparing for our festival, as are individuals who are applying for visas for our guest teachers. We can support them and encourage their work by helping raise funds. Make checks out to Zimfest Association and mail them to Janis Weeks, 1960 University St., Eugene, OR 97403. The approximate cost of room, board and (max) travel for each Zimbabwean guest is $760. Our goal is to provide 10 Zimbabwean’s, transportation, room, and board with the help of these fund raising efforts. We encourage your participation to help make this successful, and let’s have some fun with the following ideas. Share your event on the Zimfest blog (post a comment) and on facebook so that we can see all the exciting events that are being planned to support Zimbabwean teachers at Zimfest. Kudzana means to dance! Imagine all the dance, drumming, hosho, marimba, mbira, and singing communities coming together to celebrate Zimbabwean Independence Day for the benefit of Zimbabwean musicians at our festival, an interactive celebration of Shona music. During the month of April we encourage your community to host a benefit concert for Zimfest. You can choose any time in April to host your event, focusing on the April 18 Independence date. 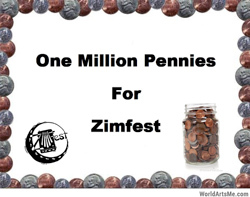 Each group could create a donation canister to have at practice and/or performances advertising the ‘One Million Penny’ goal for Zimfest. Drop in change from your wallet to go towards Zimbabwean musicians. Encourage other groups that don’t normally attend Zimfest to participate. Post pictures on the Zimfest Facebook page to show progress/competition between groups or regions. These are just a few of our ideas. Customize it to your community.